Boomer Rocket Team is an engineering competition team that designs, builds, and flies rockets of all varieties. We are a diverse team of various majors who all have a passion for rockets and flight. 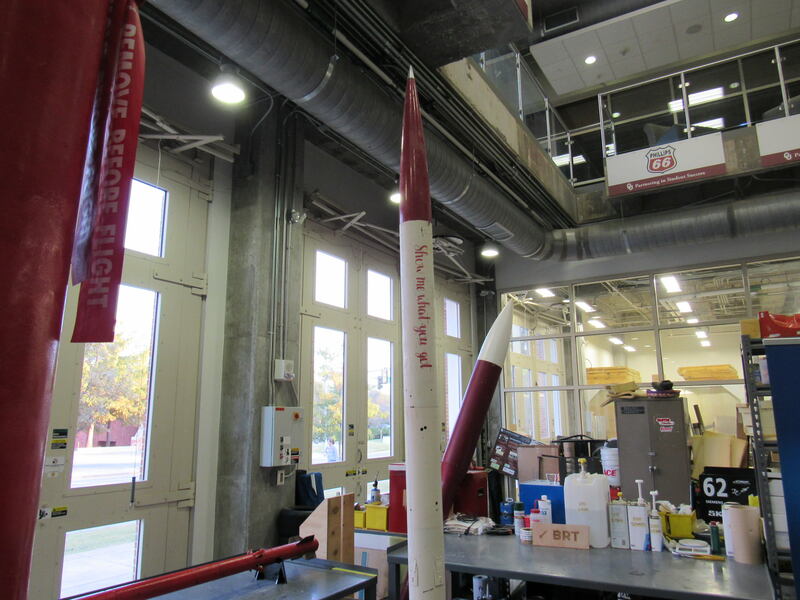 The team starts small and builds Estes rockets at the beginning of the year while teaching the basics of flight and the components of rockets. After, the team moves onto higher powered rockets and more in depth design. Finally, we start designing our competition rocket and begin the process of manufacturing it. This process is what guides the team to our annual competition, the SpacePort America Cup in New Mexico! The SpacePort America Cup is an international competition held annually in White Sands New Mexico. Numerous collegiate teams come to compete each year in various categories. Our chosen category has us delivering a scientific payload to a target altitude of 10,000 ft and returning to the Earth safely. We also will deliver and present a detailed technical report to a panel of judges. Last year, we placed 24 out of 45 teams competing. This year, we're aiming for a top 5 finish, and we're also very confident that this goal can be achieved. Pictured here is last years competition rocket, 'Show Me What You Got'. In order for us to achieve a top 5 finish at the SpacePort America Cup, we need your help! Building and testing such a large rocket is expensive, not to mention the numerous travel costs that comes with bringing a team to New Mexico. With your help we'll be able to design and test our rocket up to the highest standards and be able to present a product that us and the university can be proud of. Our goal is to represent the team and the university well. Your contribution will also foster a learning environment for all team members where they can apply what they've learned in the classroom to something in the real world. The experience gained by being a part of a competition team is invaluable and will help down the line with next years competition, internships, and eventually jobs. So please consider donating and joining our team and this journey. We'd love to have you along for the flight! The body of the rocket must be strong enough to support the force of launch and lightweight enough so as not to drag us down. Your contribution could help us buy a strong enough body tube for the task. Some would say the flashiest part of a rocket, fins keep the rocket stable in flight and allow us to soar. Your donation could buy one of our fins to help keep us on track. Although unexciting, travel costs will be one of the most expensive parts of the competition. The launch takes place over 3 days in New Mexico; travel donations will help pay for gas, food, and hotel rooms so we can be our best during competition. Part of the competition is to fly with a ten pound scientific payload. Your generous donation will help us design and build an experiment to fit in our rocket and fly to 10,000 feet collecting scientific data.